Easily expand to the Production Guide! Easily expand to the Continuous Production Program! Easily expand to the Grow Your Way to $100k Program! 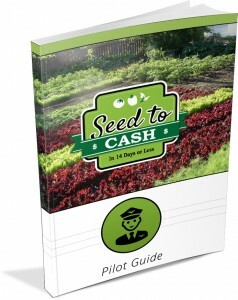 Click the button below to buy our Seed to Cash in 14 Days or Less program. Free Bonus: 60 Days Access To our Members Only Forum! Instant access to our exclusive community of successful backyard growers. Over 30+ Training Videos and 32 Membership Meetup Videos - Over 60 Hours in Content! A private facebook group for asking questions to the experts! A list of locations to buy tools and equipment at the best prices! A list of vendors that have special pricing on seeds for you! "NEXT GOAL: Perfect my work flow and record keeping so that I can advance to level 3 and double my income to [4 figures] a week." We know the feeling of seeing a great program and wanting to try it but being concerned if it will really work for you. 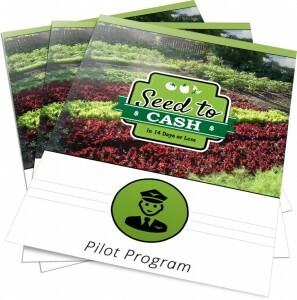 We want you to not worry about trying the Seed To Cash program so we’re making it risk free. We are going to offer a Money Back 30 Day Guarantee. That’s right. 30 days. If you join our community of gardeners, read our system, and try it but don’t think it’s worth the $299.97 you paid, just contact our customer service department within 30 days of your purchase and we’ll refund your money right away. We want to make this an easy decision to Try It Risk Free.